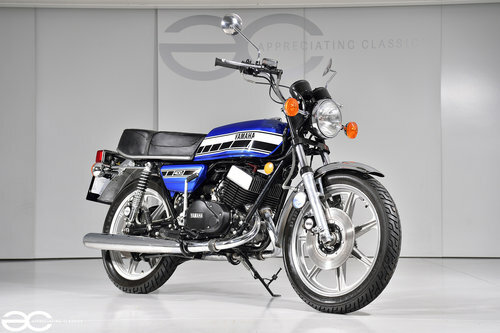 Welcome to the sale of this beautiful RD400C, which is a UK matching numbers bike. 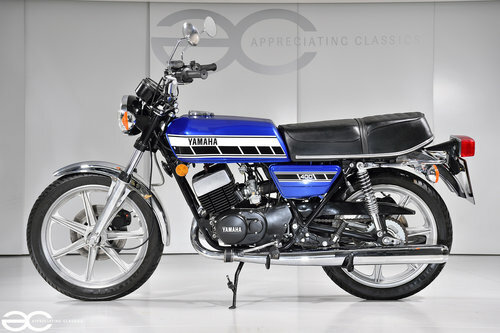 Owned by a UK collector, this RD400 is in superb order throughout. 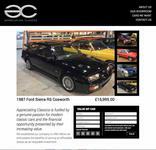 It is not very often examples come along in this type of condition, so do not miss out. 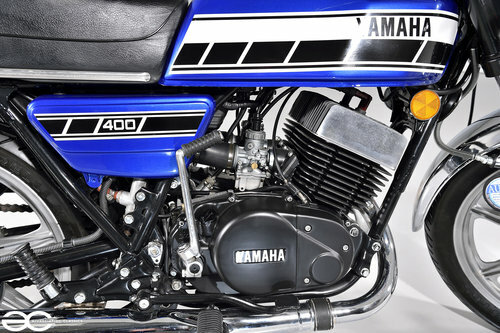 A new owner will be very pleased with this RD400, which has had a full rebuild in recent times, including a top end engine rebuild. 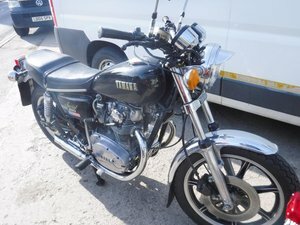 Having been part of a private UK Motorcycle collection of various iconic bikes of all ages, you can rest assured that this is not a usual well worn example which has not been looked after, this is an extremely honest example throughout. The bike is fully functional and not just a display spectacle, so is ready to be enjoyed by the new owner. 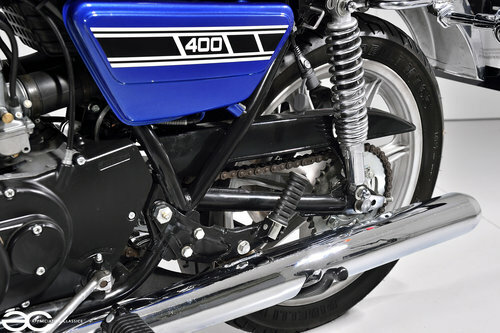 Finished in blue with the black and white Yamaha speed block motif, the appearance of this RD400 can only be described as immaculate. 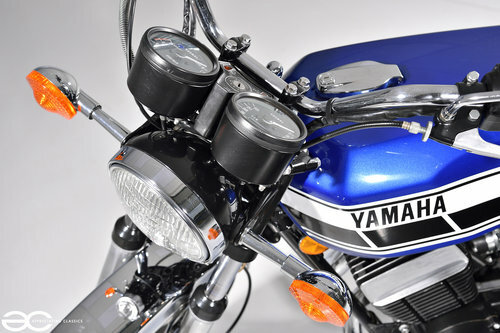 no unwanted marks are present on the paintwork, and it has clearly been painted to a very high standard with none of the usual ‘inclusions’ or poor masking as is often seen on such bikes. The attention to detail is superb throughout. The wheels are again, in great condition as are the brake calipers, and of course the frame / swingarm. 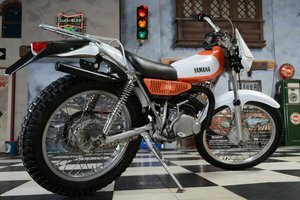 A beautiful piece of Yamaha history. As can clearly be seen in the pictures, all trims are in a condition that matches the rest of the bike, and that is superb. The chrome has a mirror finish and all decals are unmarked along with the seat. All switches, lights and controls work perfectly as does the instrument cluster. All indicators are without damage, and the rubbers – such as the foot peg rubbers, kick start, and bar grips are all in good order. 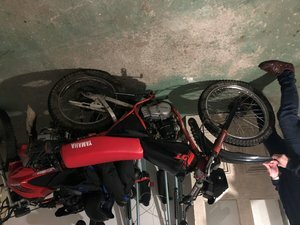 As with the rest of the bike, the engine itself has been refreshed, having had a top end rebuild in recent times, meaning that if the bike is to be used then a running in period is recommended. As for how the bike runs…… the bike runs perfectly well as you would fully expect, and rides very well indeed. A beautiful rasp and lets not forget the nostalgic 2 stroke smell of course. 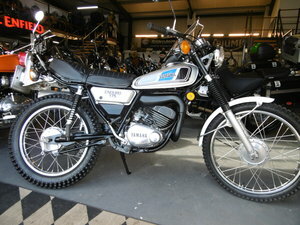 This RD400C is in fine working order across the board, the Pirelli MT65 tyres look to have barely done any miles at all. 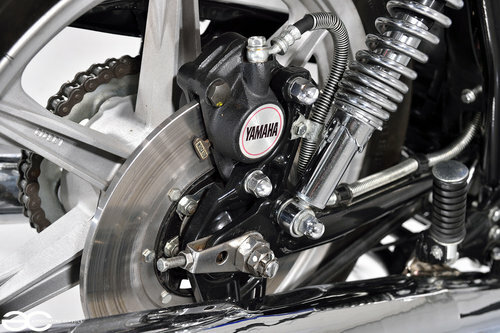 All brakes work exactly as they should do, with good feel and effective braking. The clutch and gearchange are again, a joy to operate. This example is more than fit for purpose be it enjoying it on a summers day or for display purposes.